A collaboration between local jazz musicians and singer-songwriters in Columbus has spawned a relatively newer group called the Louies. The Louies are an all star band featuring some of the area’s finest musicians from the jazz, country, and Americana formats. They perform the classic music of Louis Jordan, Louis Prima, and Louis Armstrong. 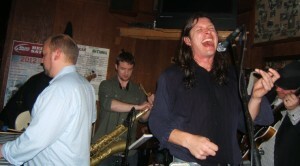 Fronting the group is Jesse Henry (Spikedrivers) on vocals, and also features Derek Dicenzo on bass, Colin Lazarski on guitar, Kevin O’Neill on sax, and Maxwell Button on drums. Together this group brings a lively show to the stage wherever they perform. This is musicianship at its best with some of the best jazz musicians and singer/songwriter/performers in the city. The band returns to Natalie’s Coal Fired Pizza this Friday, May 10th at 10pm. Previous post: The Columbus Jazz Orchestra goes wild in eighth season of JazZoo!